Home › Life in Christ › Morning Reading: Tue, 10 Apr – 1 Samuel 21-25 ~ You are a better man than I am. Morning Reading: Tue, 10 Apr – 1 Samuel 21-25 ~ You are a better man than I am. + David eats holy bread – Since there was no other food available, the priest gave him the holy bread—the Bread of the Presence that was placed before the Lord in the Tabernacle. It had just been replaced that day with fresh bread. Now Doeg the Edomite, Saul’s chief herdsman, was there that day, having been detained before the Lord. + David feigns madness – David heard these comments and was very afraid of what King Achish of Gath might do to him. So he pretended to be insane, scratching on doors and drooling down his beard. + David assembles discontents – David left Gath and escaped to the cave of Adullam. Soon his brothers and all his other relatives joined him there. Then others began coming—men who were in trouble or in debt or who were just discontented—until David was the captain of about 400 men. 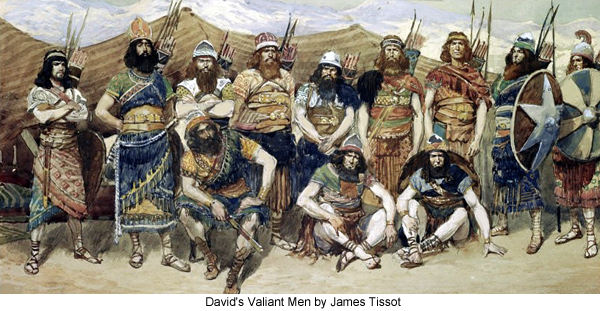 + David finds safe house for parents – Later David went to Mizpeh in Moab, where he asked the king, “Please allow my father and mother to live here with you until I know what God is going to do for me.” So David’s parents stayed in Moab with the king during the entire time David was living in his stronghold. + David returns to Judah – One day the prophet Gad told David, “Leave the stronghold and return to the land of Judah.” So David went to the forest of Hereth. The news of his arrival in Judah soon reached Saul. At the time, the king was sitting beneath the tamarisk tree on the hill at Gibeah, holding his spear and surrounded by his officers. “What is it, my king?” Ahimelech asked. + Ahimelech condemned – “You will surely die, Ahimelech, along with your entire family!” the king shouted. And he ordered his bodyguards, “Kill these priests of the Lord, for they are allies and conspirators with David! They knew he was running away from me, but they didn’t tell me!” But Saul’s men refused to kill the Lord’s priests. 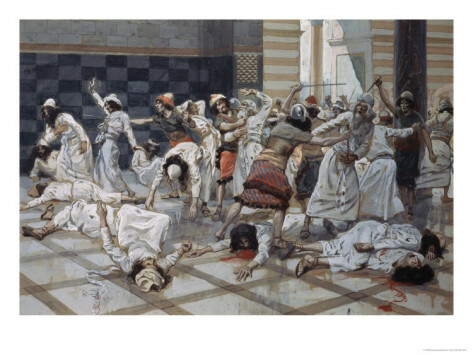 + Doeg slaughters priests and families – Then the king said to Doeg, “You do it.” So Doeg the Edomite turned on them and killed them that day, eighty-five priests in all, still wearing their priestly garments. Then he went to Nob, the town of the priests, and killed the priests’ families—men and women, children and babies—and all the cattle, donkeys, sheep, and goats. + David slaughters the Philistines – So David and his men went to Keilah. They slaughtered the Philistines and took all their livestock and rescued the people of Keilah. Now when Abiathar son of Ahimelech fled to David at Keilah, he brought the ephod with him. + Saul moves against David – Saul soon learned that David was at Keilah. “Good!” he exclaimed. “We’ve got him now! God has handed him over to me, for he has trapped himself in a walled town!”So Saul mobilized his entire army to march to Keilah and besiege David and his men. + David escapes to wilderness – So David and his men—about 600 of them now—left Keilah and began roaming the countryside. Word soon reached Saul that David had escaped, so he didn’t go to Keilah after all. David now stayed in the strongholds of the wilderness and in the hill country of Ziph. Saul hunted him day after day, but God didn’t let Saul find him. 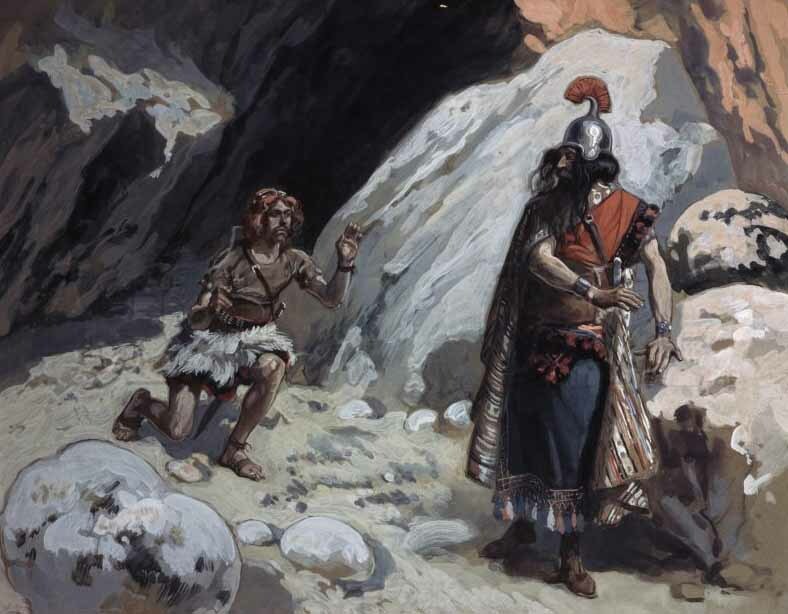 + David and Jonathan renew pact – One day near Horesh, David received the news that Saul was on the way to Ziph to search for him and kill him. Jonathan went to find David and encouraged him to stay strong in his faith in God. “Don’t be afraid,” Jonathan reassured him. “My father will never find you! You are going to be the king of Israel, and I will be next to you, as my father, Saul, is well aware.” So the two of them renewed their solemn pact before the Lord. Then Jonathan returned home, while David stayed at Horesh. 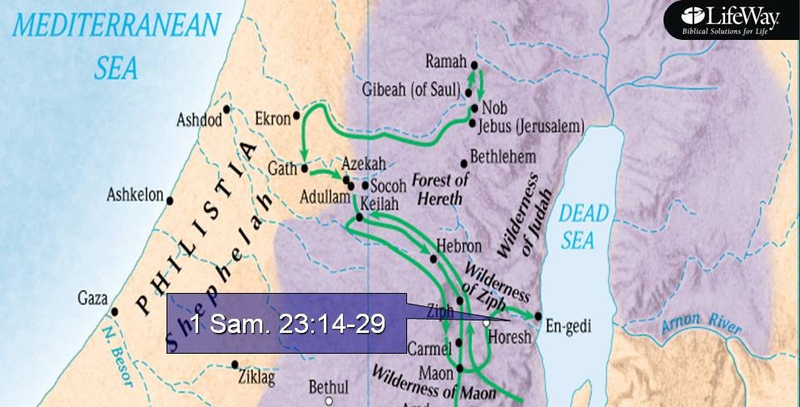 + Saul prepares attack – “The Lord bless you,” Saul said. “At last someone is concerned about me! Go and check again to be sure of where he is staying and who has seen him there, for I know that he is very crafty. Discover his hiding places, and come back when you are sure. Then I’ll go with you. And if he is in the area at all, I’ll track him down, even if I have to search every hiding place in Judah!” So the men of Ziph returned home ahead of Saul. + David retreats farther – Meanwhile, David and his men had moved into the wilderness of Maon in the Arabah Valley south of Jeshimon. When David heard that Saul and his men were searching for him, he went even farther into the wilderness to the great rock, and he remained there in the wilderness of Maon. But Saul kept after him in the wilderness. + Saul quits to defend Israel – Saul and David were now on opposite sides of a mountain. Just as Saul and his men began to close in on David and his men, an urgent message reached Saul that the Philistines were raiding Israel again. So Saul quit chasing David and returned to fight the Philistines. Ever since that time, the place where David was camped has been called the Rock of Escape. David then went to live in the strongholds of En-gedi. + Saul searches for David in En-gedi – After Saul returned from fighting the Philistines, he was told that David had gone into the wilderness of En-gedi. So Saul chose 3,000 elite troops from all Israel and went to search for David and his men near the rocks of the wild goats. + David’s restraint – But then David’s conscience began bothering him because he had cut Saul’s robe. He said to his men, “The Lord forbid that I should do this to my lord the king. I shouldn’t attack the Lord’s anointed one, for the Lord himself has chosen him.” So David restrained his men and did not let them kill Saul. + David pleads his case to Saul – Then he shouted to Saul, “Why do you listen to the people who say I am trying to harm you? 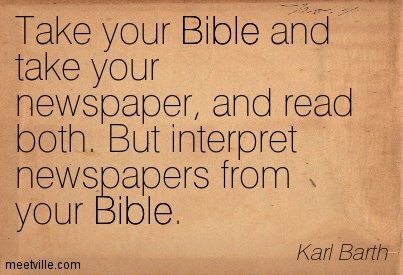 This very day you can see with your own eyes it isn’t true. For the Lord placed you at my mercy back there in the cave. Some of my men told me to kill you, but I spared you. For I said, ‘I will never harm the king—he is the Lord’s anointed one.’ Look, my father, at what I have in my hand. It is a piece of the hem of your robe! I cut it off, but I didn’t kill you. This proves that I am not trying to harm you and that I have not sinned against you, even though you have been hunting for me to kill me. So David promised this to Saul with an oath. Then Saul went home, but David and his men went back to their stronghold. Now Samuel died, and all Israel gathered for his funeral. They buried him at his house in Ramah. Then David moved down to the wilderness of Maon. There was a wealthy man from Maon who owned property near the town of Carmel. He had 3,000 sheep and 1,000 goats, and it was sheep-shearing time. This man’s name was Nabal, and his wife, Abigail, was a sensible and beautiful woman. But Nabal, a descendant of Caleb, was crude and mean in all his dealings. + David requests provisions – When David heard that Nabal was shearing his sheep, he sent ten of his young men to Carmel with this message for Nabal: “Peace and prosperity to you, your family, and everything you own! I am told that it is sheep-shearing time. While your shepherds stayed among us near Carmel, we never harmed them, and nothing was ever stolen from them. Ask your own men, and they will tell you this is true. So would you be kind to us, since we have come at a time of celebration? Please share any provisions you might have on hand with us and with your friend David.” David’s young men gave this message to Nabal in David’s name, and they waited for a reply. + David responds in force – So David’s young men returned and told him what Nabal had said. “Get your swords!” was David’s reply as he strapped on his own. Then 400 men started off with David, and 200 remained behind to guard their equipment. + Abigail sends peace offering – Abigail wasted no time. She quickly gathered 200 loaves of bread, two wineskins full of wine, five sheep that had been slaughtered, nearly a bushel of roasted grain, 100 clusters of raisins, and 200 fig cakes. She packed them on donkeys and said to her servants, “Go on ahead. I will follow you shortly.” But she didn’t tell her husband Nabal what she was doing. When Abigail saw David, she quickly got off her donkey and bowed low before him. She fell at his feet and said, “I accept all blame in this matter, my lord. Please listen to what I have to say. I know Nabal is a wicked and ill-tempered man; please don’t pay any attention to him. He is a fool, just as his name suggests. But I never even saw the young men you sent. + Abigail presents peace offering – “Now, my lord, as surely as the Lord lives and you yourself live, since the Lord has kept you from murdering and taking vengeance into your own hands, let all your enemies and those who try to harm you be as cursed as Nabal is. And here is a present that I, your servant, have brought to you and your young men. Please forgive me if I have offended you in any way. The Lord will surely reward you with a lasting dynasty, for you are fighting the Lord’s battles. And you have not done wrong throughout your entire life. + God strikes Nabal dead – When Abigail arrived home, she found that Nabal was throwing a big party and was celebrating like a king. He was very drunk, so she didn’t tell him anything about her meeting with David until dawn the next day. In the morning when Nabal was sober, his wife told him what had happened. As a result he had a stroke, and he lay paralyzed on his bed like a stone. About ten days later, the Lord struck him, and he died. When David heard that Nabal was dead, he said, “Praise the Lord, who has avenged the insult I received from Nabal and has kept me from doing it myself. Nabal has received the punishment for his sin.” Then David sent messengers to Abigail to ask her to become his wife. + David’s wives – She bowed low to the ground and responded, “I, your servant, would be happy to marry David. I would even be willing to become a slave, washing the feet of his servants!” Quickly getting ready, she took along five of her servant girls as attendants, mounted her donkey, and went with David’s messengers. And so she became his wife. David also married Ahinoam from Jezreel, making both of them his wives. Saul, meanwhile, had given his daughter Michal, David’s wife, to a man from Gallim named Palti son of Laish. Tags: 1 Samuel 21-25, 10 Apr, Abigail Intercedes for Nabal, Daily Reading, David at the Cave of Adullam, David Hides in the Wilderness, David Marries Abigail, David Protects the Town of Keilah, David Runs from Saul, Jesus Christ, Morning Prayer, Nabal Angers David, Northumbrian Community, PowerPoint Reading Plan, Samaritan's Purse, The Death of Samuel, The Slaughter of the Priests, Worship, You are a better man than I am.